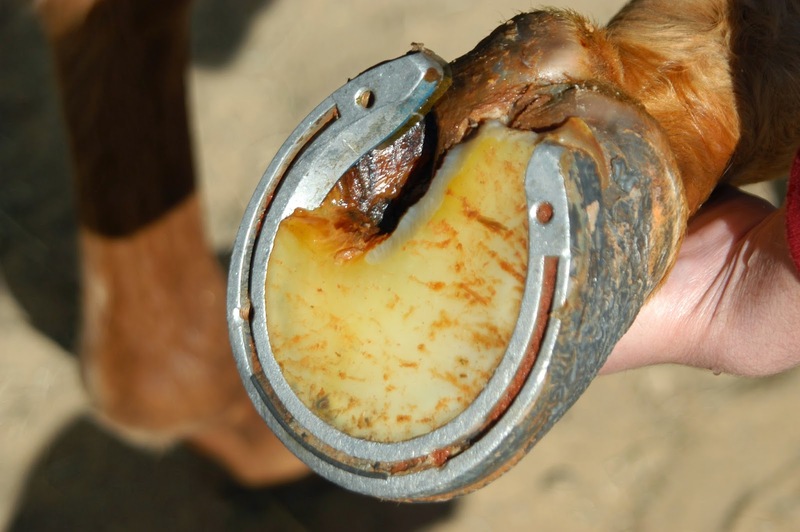 Even experienced horse owners can neglect the basics when it comes to hoof trimming. If you want to get it right, take yourself through the following steps to ensure that your horse is getting the best possible maintenance and care. You'll unsettle your horse if you have to stop halfway through hoofing to hunt down your rasp or trimmer. Once you start, make sure you can see it through until the end. Softened hooves are much easier to work with than hard, dry hooves. You can moisturize them yourself with a wet cloth, or if it's rained recently, just lead your horse through puddles for a few minutes. Take a pick to their hooves to remove any grass or gravel that has accumulated in the depressions. Be nice and thorough; leftover debris can cause you to rasp unevenly later. Use a brush for one final sweep. Clip away the excess around the hoof wall with special nippers made specifically for equine care. You can learn more about these implements here. Don't rasp in small increments; you'll wind up leaving your horse off-balance when you sand him down unevenly. Take your rasp from heel to toe in long, sure strokes that apply equal pressure throughout the hoof. This is just a quick guide to trimming your horse's hooves the right way. Every creature will require personalized care, so don't feel that you have to follow it exactly!